This article by Robin Lovell-Badge, published this week in Development, gives a front-row view of the CRISPR babies scandal from last year. When the story broke, we collated reactions from the field – be sure to check them out too. Towards the end of November 2018, news broke that the Chinese researcher He Jiankui had created the world’s first genome-edited babies. This came shortly before the start of the Second International Summit on Human Genome Editing, where researchers, ethicists and others concerned with regulation, social issues and public engagement from around the world gathered to discuss the latest advances in the field. In this Spotlight, I provide my perspective on the events that occurred shortly prior to and at the summit, where He Jiankui gave an account of his activities. I also discuss what was wrong with his approach and how, after more research and with appropriate regulation, clinical applications of germline genome editing in humans may be justifiable. A month or so before the Second International Summit on Human Genome Editing took place, several of us on the organising committee heard rumours that He Jiankui (Southern University of Science and Technology, Shenzhen, China; who I’ll refer to as JK) was using genome-editing techniques on human embryos for the purposes of trying to make children who would be resistant to infection by HIV. We knew that JK had presented relevant work, involving genome editing in mouse and monkey embryos, at meetings over the last couple of years, and that he had also started using the methods on human embryonic stem cells and human embryos in culture. However, there was concern that he felt he was in a position to try things for real: to make genome-edited human babies. We also heard rumours that JK had obtained local ethics committee approval to go ahead. Therefore, when we were deciding on additional speakers for the summit, JK’s name came up. Although we were aware that he had not published in this area, he had clearly been doing relevant research and we thought it might be useful for him to attend the summit where the science, safety, ethics and regulatory issues surrounding genome editing would be discussed. We sent him an invitation and he responded almost immediately to say that he would be very happy to present. As moderator of the session he was going to be in, I had a conference call with JK and other speakers shortly before the summit. In advance of that call, JK sent me a draft summary of his talk. The summary highlighted the areas he was going to cover, including some preclinical data, but it certainly did not mention that he had edited human embryos and implanted them. That evening, Jennifer, myself and JK were joined by a few other committee members, including Alta Charo (University of Wisconsin-Madison, USA) and Matt Porteus (Stanford University, CA, USA). JK had brought his laptop to show his data. As he explained what he’d done, we were increasingly horrified, while JK was getting more and more anxious, in part because we were challenging him, but also because he had apparently started to receive threats and was nervous the press would find him. He left, having checked out of the hotel where all of the speakers were staying, and moved to a different, undisclosed hotel. I maintained contact with JK via e-mail and continued to encourage him to speak at the summit, and we discussed the arrangements we were prepared to make for him. This involved splitting the session he was in to allow the first four speakers to have a separate Q&A session before JK’s talk. Of course, we also had to take special security measures. He disclosed his location to Hong Kong University security, who brought him to the venue, where he was to wait in a hidden room until I called for him to give his presentation. 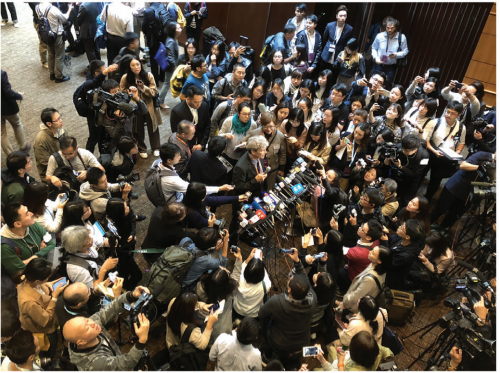 We knew there were going to be many journalists attending – indeed there were about 160 corralled into one section of the auditorium – and that they would have many questions. To prevent an unruly Q&A session, we asked the journalists to write their questions out in advance. I also had permission to close the session if the media or other audience members misbehaved, and I warned everyone of this, both at the start of the session and just before JK’s talk. As with the rest of the summit, the first four talks of the session were excellent and stimulated some good discussion. However, everyone was anticipating JK’s talk. There was a nervous wait between my calling him to come on to the stage and his appearance, and then we couldn’t hear anything because the cameras were going off continuously. I had to ask the photographers to stop before things quietened down enough for JK to give his talk. Matt Porteus then joined us on the stage and the two of us questioned him to ensure we all had the full story. This is when it transpired that there was a second woman with an early pregnancy from a genome-edited embryo, and that JK himself had taken the consent from the ‘patients’ (the prospective parents), which is against standard practice in experimental clinical practice. David Baltimore, the chair of the organising committee, then made a personal statement, relating his views – essentially his horror and dismay at what he had just heard –before I took questions from the audience and read selected ones from the media. The whole idea was to get JK to talk, because we knew that this would be the only opportunity that most people would have of interacting with him. The questions were often challenging and the answers sometimes evasive, sometimes direct, but all revealed how much JK had thought his work important, but how little he matched normal standards of evidence and clinical practice. So, what do we know about the study itself? We know that JK submitted a paper(s) to a journal, but it is doubtful that the study meets the (or any) journal’s requirements concerning ethics approval, consent, etc. The hospital referred to in some of the clinical trial documents denies knowing about the work, although it is possible this might be to protect the identity of the families concerned. The latter was something JK stressed was important, but he clearly had not thought through very carefully what would happen to them when the story broke. We also know that there were eight couples enrolled in the trial, but that one dropped out. In total, many embryos have been manipulated, cultured, subjected to preimplantation genetic diagnosis (PGD) and then frozen. We don’t know how many attempts have been made at transferring them. All we know is that two embryos from one couple were implanted, which resulted in the twin baby girls (known as ‘Lulu’ and ‘Nana’), and that another embryo transfer has led to an ‘early stage pregnancy’. It is clear that JK, who is a physicist by training, had been building up to do this for quite some time, but he clearly bypassed the normal practices of science and clinical practice. He apparently did talk to a few experts on genome editing, but ignored their advice, and should have talked to more. He did not properly consider the risks of using genome-editing techniques in human embryos; indeed, he ignored evidence indicating incorrect on-target alterations, off-target events and mosaicism in the embryos that were implanted. Moreover, JK did not give adequate thought to the gene he was targeting. CCR5 is clearly an interesting gene. It is the subject of the first somatic genome-editing clinical trial for treating patients with HIV/AIDS. There are millions of people who naturally have mutations in CCR5, the most common being the delta-32 mutation, which is thought to have arisen in Northern Europe and confers resistance to HIV/AIDs. Perhaps that is why JK thought that making babies with this mutation would be fine. But he clearly hadn’t read widely enough or thought deeply enough about the consequences. There are almost no people with the delta-32 mutation living in China (Jiang et al., 1993). Therefore, it is necessary to ask ‘why?’ Perhaps the mutation simply has not spread this far. Or is it because carrying this CCR5 mutation might also confer susceptibility to something else? It is already known that it makes individuals more sensitive to Western Nile virus. There are also claims that it can make people more sensitive to the bad effects of influenza, although there are also reports suggesting that it does not (e.g. Matos et al., 2019). These studies deal with relatively low numbers of individuals in different countries, before or after recent pandemics may have skewed results, making it difficult to come to any conclusion, and certainly not with respect to the consequences of mutating CCR5 in individuals of Chinese origin. Some papers published a while ago do report other different specific CCR5 mutations in China (Ansari-Lari et al., 1997; Shioda et al., 2001), with some in vitro evidence suggesting weak HIV resistance, but there does not seem to have been any follow-up studies to confirm this. JK may have been aware of this research, but went ahead anyway, without judging that more needs to be done to provide concrete data. It has also been reported that decreased CCR5 activity can improve cognitive function in mice (Zhou et al., 2016). Of course, mice and humans are very different, but this raises the issue of whether mutating CCR5 might actually ‘enhance’ individuals rather than just making them resistant to a virus. Again, JK said publicly that he was aware of this study, but he ignored it. JK had not published any of his preclinical data, raising some doubt that he was competent to carry out what he has claimed, but in failing to do so he has given the impression that he wanted to conduct the work in secret. Of course, this also means he has failed to benefit from the critical process of peer-review. He obviously hadn’t taken sufficient advice to understand the best way of going about doing a very novel, clinical procedure. He also seems to have assumed he knew best when it came to the ethics of what he was doing and the way to obtain consent from the parents, when in reality this fell far short of normal practice, with JK conducting much of this himself, apparently with his ex-mentor Michael Deem (from Rice University, Houston, TX, USA), another physicist. He also did not talk to the relevant regulators to seek their approval. Yet he did seem to be aware of the regulations; however, when challenged, he argued that they were guidelines – they weren’t laws – and that they were drawn up with respect to stem cell research and were not relevant to what he had done. Naturally, there was quite a lot of discussion at the summit about whether or not what he did was illegal. We will have to wait and see exactly what happens, but most commentators in China say that he has directly contravened laws, although it is unclear whether there are any penalties prescribed for doing so. So why did JK do this? I think that he honestly thought he was doing a good thing and that everyone would realise this. He seems a driven and ambitious person, who had had success in his work on genome-sequencing technologies, and he wanted to be the first to carry out germline genome editing. He told us that his hero was Bob Edwards, who pioneered IVF, and that he thought it was amazing how many babies have been born through this approach. JK thought germline genome editing would be the next big thing and wanted to emulate his hero. However, Edwards published all the experimental and preclinical work that led up to the first successful application of IVF, and subsequent research. Other scientists, clinicians and the relevant authorities knew what Edwards was doing and why. There weren’t specific regulations at the time, and there probably had not been much public dialogue beforehand, something that has subsequently become important, but Edwards didn’t do anything against people’s expectations, and his intentions were not just clear, they were open. In contrast, JK failed to do any of this. JK’s rationale for doing what he claims was to try to make children resistant to HIV. Some have argued that this is a form of enhancement, and that this is wrong in itself. However, it is not as simple as that. Vaccines give people disease resistance and their use is not only widely accepted, it is encouraged. However, JK did not properly take into account the risks of editing CCR5, and the way that he did this, versus any benefit. Making novel genetic alterations, especially in a gene whose normal function is not sufficiently well understood, poses lots of risks, and of course there are risks to the children if their identity becomes known. Moreover, all these risks are unnecessary since, as mentioned above, there was no clinical need or benefit for the genome editing in this case. But are there instances in which genome-editing human embryos might be beneficial? In my opinion, there are. For instance, there are cases in which one parent is homozygous for a dominant disease-causing mutation – an obvious case is Huntington’s disease. Although this is very rare overall, there are clusters of individuals where this happens, and thus cases where such diseases have blighted families for generations. There are also rare instances where both parents are homozygous for a recessive deleterious variant of a gene and, again, it is not possible for them to have children that aren’t affected. In the case of heterozygote parents, PGD following IVF can be used to select embryos that aren’t affected. But while PGD sounds straightforward – it involves testing for the presence of the abnormal and normal allele in a biopsy of a few cells taken from each preimplantation embryo after IVF, and only implanting those that are disease free – there are lots of complications associated with this approach. It is necessary to find an embryo that is going to be free from the disease, but that is also good enough quality to give you a child, and that’s often a challenge, especially if the number of embryos obtained is low, which happens all too often. Some genetic diseases affect fertility, adding to the problem. A recent paper that evaluated data on PGD showed that a surprisingly large number of families never got the child they wanted because it was just too inefficient (Steffann et al., 2018). And that’s just if you’re screening the embryos for one gene variant. If you have to do two or more, it becomes really difficult to find an appropriate embryo to transfer. This is the case for ‘saviour’ siblings, where a couple already have one child, but that child has developed leukaemia, and they want to have a second child anyway in order to use bone marrow from the second child to rescue the first. Indeed, in a recent programme conducted at Harvard Medical School involving eight families, each woman went through, on average, five cycles of IVF, which is a lot, but only one baby was born who could be a saviour sibling. By using genome editing to correct the mutation leading to leukaemia, and by just carrying out the screening for tissue typing, it may have been possible to have helped all of those families. We also need to be aware that, as somatic gene therapy and conventional treatments improve, we are going to reach a situation where many more individuals suffering a genetic disease will survive to reproductive ages. They may want to have their own genetically related children, but without passing on probably even one deleterious allele to their children. Duchenne Muscular Dystrophy, for example, is an interesting case. Very few boys with this survive to reproductive age. However, if somatic gene editing works, those boys will now have the gene corrected in the relevant somatic cells but not in their germline. They might feel that embryo genome editing could give them the chance to overcome this and have children of their own that are unaffected and also not burden future generations with the need to undergo PGD or be fearful of having children. Overall, I think there is a medical need for genome editing in human embryos, a conclusion reached by the US National Institutes of Sciences’ and the Nuffield Council’s reports on human genome editing and by other organisations. Although it is still too early to begin clinical trials, I think it would actually be irresponsible for us not to explore this opportunity further. We need to do the basic research, determine exactly what we can and can’t do, and work out whether we can really make genome editing efficient and safe enough to use in human embryos. The science is progressing fast, and new methods look very promising. The newly developed approach of base editing, for example, may be much safer than other approaches because it doesn’t involve a double-strand DNA break and hence avoids NHEJ-induced inappropriate on-target deletions or insertions. Off-target effects can be minimised by careful design of guide RNAs and through introducing the genome-editing components to minimise the period during which they can act. In fact, evidence now suggests that off-target effects are very rare. For example, work from my colleague Kathy Niakan (Francis Crick Institute, London, UK) revealed some on-target problems, but no off-target events (Fogarty et al., 2017). Shoukhrat Mitalipov (OHSU, Portland, OR, USA) also used genome editing in human embryos and did not observe off-target events (Ma et al., 2017, 2018). Even in JK’s study, the PGD analysis suggested that while there might have been an off-target event in one embryo, when they analysed DNA from the babies at birth this had disappeared. But of course, we have not seen all the data and how it was generated; there could be additional off-target events of which JK is unaware. Assuming we can get to a point where the editing is efficient and safe, we clearly need to make sure it is used appropriately. Indeed, in the NAS report on Human Genome Editing (published in February 2017), we set out various guidelines, conditions and principles that should be considered when editing the human genome. These clearly weren’t enough to stop JK, so there have been, of course, calls for a moratorium. But I don’t think this would serve any purpose. How do we enforce one? Should this be just a temporary pause? For how long? What conditions would need to be met before we could lift the moratorium? Would a moratorium have stopped JK? I don’t think it would have. Moreover, to achieve a moratorium you would have to have consensus from all countries, which is again extremely unlikely. Therefore, I think it’s more a question of coming up with better guidelines. This would have to be carried out in a much more detailed way than has been the case to date. We clearly need to set out the minimal conditions that would have to be met with respect to a variety of issues: the scientific and clinical issues surrounding the gene that is being modified; the types of alleles that are being altered; the clinical need for the suggested alteration; and the efficiency, accuracy and safety of the proposed techniques (in terms of off-target events, on-target events, mosaicism, etc.). We should also establish the minimum requirements in terms of preclinical data (e.g. experiments in animals, human stem cells and perhaps in human embryos in vitro) and ask that they should be published. Processes for obtaining consent and ethical review approval should also be spelled out. Finally, we should also detail how the patients would be looked after and tracked, how we could actually diagnose what has happened in the embryos, how long-term follow up studies would be reported, and how patient protection and privacy will be considered. It has been suggested that this call for such a detailed translational pathway might encourage clinical applications and potentially ‘rogue’ applicants. However, my view, and that of the summit organising committee, is that it would act to discourage them if it is sufficiently detailed and stringent; it should deter practitioners who cannot meet those conditions. They will know in advance that they will not get support from other scientists, clinicians, regulators, local ethical review panels, journals, etc., unless the requirements have all been met. Once we have this kind of framework, countries can use it appropriately, adapting it into their own regulatory systems. But we do need to make sure that the rules and regulations we set now are flexible enough to account for rapid progress in the science and in the attitude of the public who may benefit. Of course, this is not the first time that the development or application of a biological technique has shocked or concerned the public: recombinant DNA, the first IVF baby, Dolly the cloned sheep and mitochondrial replacement were all met with opposition when they were first announced. Is this case any different? I’m hoping that we get over the shock, and that genome editing of human embryos gradually becomes a viable and sensible approach to deal with some distressing genetic conditions. When the first test tube babies were announced, the public and the media were generally very happy about it. But this was soon followed by a backlash. In that case, the backlash was driven largely by gut reactions and fear of dystopian futures coming from science fiction, although religious, ‘pro-life’ and anti-progress views also contributed. Of course, things then calmed down and IVF is now a well-accepted technique, albeit one where new developments still occupy the media. ‘Three-parent babies’ produced by mitochondrial replacement was also an approach that created a lot of fuss, but the notion behind it has become more widely accepted. Actually, I think this technique and its application represents a good lesson on how you should go about developing a new technology that applies to human embryos. Lots of hard work went into looking at the science, evaluating the clinical need, exploring the ethical issues, asking the public for their views, changing the law in the UK and establishing detailed regulations and guidelines, including considering the future welfare of the patients and any children born. Notably, all of this was carried out in an open manner, with all the preclinical scientific data published and active debate encouraged. Now, based on this process, other countries such as Australia and Singapore might change their regulations to make mitochondrial replacement possible. It’s a pity that JK did not follow this example. Overall, while JK’s behaviour has largely been deemed unconscionable by the scientific community, ethicists and others, I don’t think we should consider this a big setback to the field. JK seems to have been driven in part by ambition and a desire for fame – his motives were just wrong. But we should use his case as an opportunity to highlight how things should be done and how the vast majority of scientists – including developmental biologists – are actually very responsible. The whole affair has had another good outcome, in that it has certainly stimulated much wider debate than we ever thought would be possible. 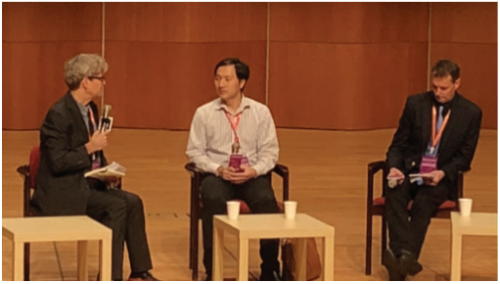 Just as a simple example, the organising committee of the first summit on Human Genome Editing in 2015 were delighted that between 6000 and 7000 people watched the live webcast. We had 1.8 million watch the live webcast this time. In addition, the worldwide media coverage means that many, many more people have been talking about the topic and thinking about these issues. Although some of this has stirred up negativity, this level of public exposure can only be good for the field and highlights the importance of establishing a dialogue with the public. Indeed, at the public event we ran in Hong Kong after the main summit finished, which was organised with the help of the Hong Kong Association for Rare Diseases and a local Café Scientifique, participants were critical of JK’s actions but were not negative about the potential uses of the technology. In fact, many realised that it could have great benefit. This just highlights that we need to talk more with the public about these kinds of techniques. Obviously, genome editing – in both the germline and somatic cells – needs to be considered. However, there are other techniques, such as culturing human embryos in vitro beyond the current 14-day limit, embryo-like entities and human-animal chimeras, that need to be debated. Another big issue is in vitro-derived gametes: if we can make eggs and sperm in vitro then this will change many things, not just in terms of research, but potentially in terms of reproductive options. All these ‘ethical minefields’ really need to be discussed more broadly, with a goal to develop flexible but robust regulation that can keep up with changes in both science and public attitudes. I know that public engagement exercises are often expensive, and it is sometimes hard to reach out to people and give them the information that’s needed for them to be properly involved in these types of discussions. However, we clearly need participation from many more scientists and other relevant individuals (e.g. ethicists, regulators) to raise the level of the conversation with members of the public, not only to make sure that they are well informed, but also to seek their views. The decision of whether or not techniques such as genome editing in human embryos ever go into the clinic cannot be a decision made by scientists or clinicians alone; it has to be a decision that is made by all those concerned. Ansari-Lari, M. A., Liu, X. M., Metzker, M. L., Rut, A. R. and Gibbs, R. A. (1997). The extent of genetic variation in the CCR5 gene. Nat Genet. 16, 221-222.
editing reveals a role for OCT4 in human embryogenesis. Nature 55, 67-73.
mutation in human embryos. Nature 548, 413-419. Dyken, C., Li, Y., Koski, A., Liang, D. et al. (2018). Reply. Nature 560, E10-E23. Matos, A. R., Martins, J. S. C.C., Oliveira, M. L. A., Garcia, C. C., Siqueira, M. M.
pandemic period. Infect. Genet. Evol. 67, 55-59. Steffann, J., Jouannet, P., Bonnefont, J. P., Chneiweiss, H. and Frydman, N.
embryo genome? Cell Stem Cell 22, 481-482.
cortical plasticity and hippocampal learning and memory. eLife e20985.